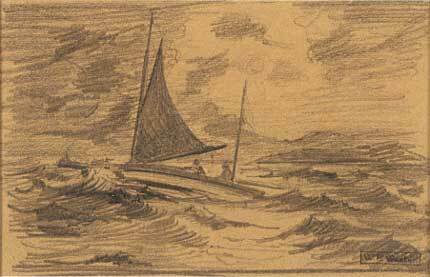 Pencil on Paper 6" x 9"
Sailing was one of Weston’s favourite hobbies, but he rarely painted the sea. He often went cruising along the coast and belonged to the Royal Vancouver Yacht Club for over 25 years. One reviewer thought this was a basis for the feeling of the strong drive of the wind in his paintings.